It was 2 p.m. on a brilliant blue September day in the Pacific Northwest as I made the turn out of Saratoga Passage, heading for the big, bending curve that would lead us around the easternmost coast of Whidbey Island and into Skagit Bay. I was at the helm of a new North Pacific 28-hull number one, in fact-bound for the buoys that would lead us into Swinomish Channel. The afternoon sun slanting in the portside windows of the saloon and pilothouse had warmed the interior nicely, leading my wife, Peggy, to stretch out on the settee for a languorous nap. I planned to wake her soon, as we approached La Conner, to discuss whether to tie up there for the night or press on to Anacortes. As it turned out, we chose Anacortes and had a nice stroll down Commercial Avenue for dinner. La Conner would have to wait for another cruise. We had passed a busy morning, boarding the NP 28 early in her slip at Shilshole Bay Marina, stowing supplies and food in short order, and finally getting under way around 8 a.m. for Peggy&apos;s very first Pacific Northwest cruise. Over the next five hours, thanks to a window of wonderfully clear weather, we soaked up the beauty of the water and the landscape surrounding Puget Sound. 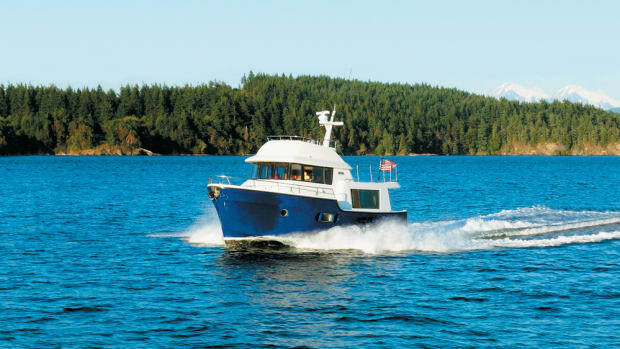 Despite its modest length and beam, which make it road legal for those with the right tow vehicle, the NP 28 has an abundance of windows-five total in the pilothouse, two more in the sliding pilothouse doors, and two distinctive circular portlights-for outstanding visibility through roughly 270 degrees. The boat offers a wonderful, well-protected window on the cruising world, and I was enjoying every minute of it. When Trevor Brice, president of North Pacific Yachts, first suggested that I take the new NP 28 cruising for a couple of days following her debut and display at Seattle&apos;s Lake Union Boats Afloat Show last autumn, I was immediately interested. The new model joins a growing segment of the cruising boat marketplace that aims to fulfill the needs of entry-level buyers, as well as experienced owners who are looking to downsize. Affordability is the key to success in this niche, so offering a boat in a well-equipped state for under $200,000 has become the mantra of builders who want to succeed in this segment of the cruising-under-power market. By keeping the overall weight modest and the beam at highway-legal trailering widths, owners who buy a boat like the NP 28 are given the option of storing the vessel on a trailer in the off season or hauling it from colder to warmer-weather climes when their need to cruise grows more urgent. When Trevor and his father, John Brice, founded North Pacific Yachts in 2003, they did so with the experience of owners and operators of boats that provided less than adequate storage, unworkable layouts, high-maintenance exteriors, and more. They knew that, given the right platform, which they found in the proven CHB semi-displacement trawler hull, they could deliver a cruiser that would solve these problems. The result was the launch in January 2004 of the North Pacific 43 (called the 42 at the time), a wellfound trawler with a traditional teak interior, plenty of storage, and good working spaces on deck. The important features that defined the NP 43 would trickle down through the North Pacific product line over the next few years, and they are equally evident in the new NP 28. These include excellent visibility from the raised pilothouse, easy access to systems and equipment, a full-beam layout, and much more. 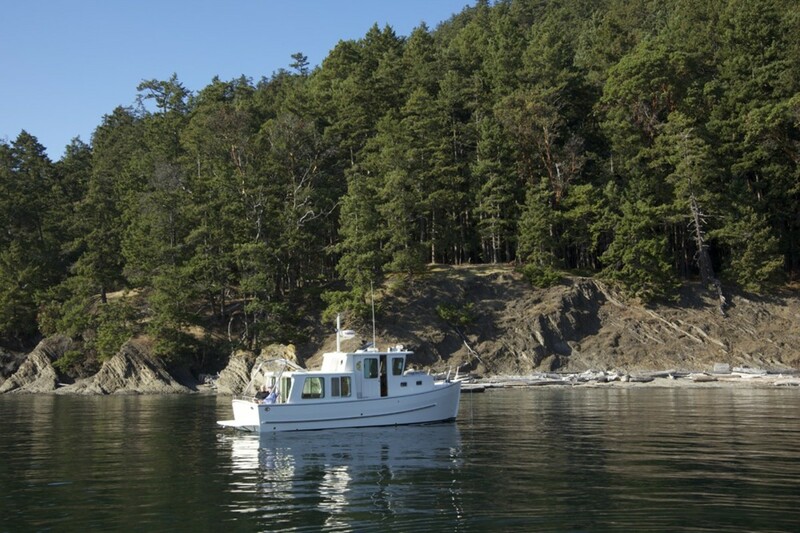 The NP 28 is based on a design from the board of naval architect Karl Stambaugh at Chesapeake Marine Design (www.cmdboats.com), a design that closely fit the North Pacific overview of what works on a cruising boat. Generally, the layout is that of a typical raised-pilothouse trawler, with large windows, wellprotected working spaces fore and aft on deck, and a full-beam saloon to maximize interior volume for livability and storage. Planking cove lines are molded into the hull sides for visual appeal, and there is a near full-length rubrail to protect the sides. The modified-V hull has a solid, fulllength keel to protect the running gear, with a gradual rise to the sheer as buoyancy and flare increase forward, and a near-plumb stem for a classic look. 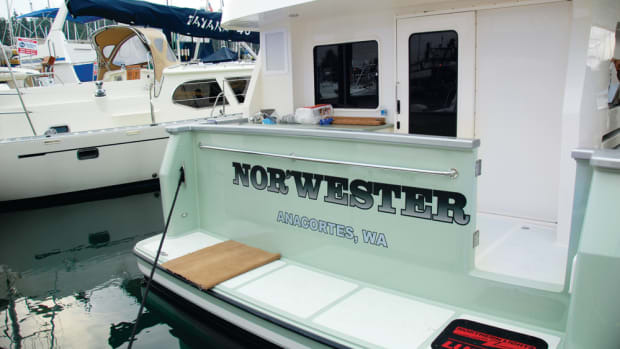 Following the building practices found on its larger designs, North Pacific hand-laminates the NP 28 hull with vinyl ester resins in the outer layers, two layers of epoxy barrier coat below the waterline, and overlapping layers of fiberglass cloth, minimizing the chance of osmotic blistering. A molded fiberglass grid bonded to the inner surface of the hull adds strength without wood reinforcement. Three layers of Micron CSC bottom paint seal the running surface. To keep weight above the waterline to a minimum, North Pacific molds the deck and superstructure with a sandwich of handlaid fiberglass and Nida-Core structural honeycomb that combines strength and resilience while adding insulation to minimize noise and sweating. Aluminum plates are embedded in the structure for strong, rot-free attachment of stainless steel railings. I spent half a day with Trevor Brice, going over the features and details of the NP 28 before embarking on our cruise. One of the first encountered and most appreciated features was the full-width swim platform with drainage slots and a swim ladder, mounted externally across the transom, that helps make boarding from floating docks more secure. The platform is deep enough to store a dinghy on edge, but that would obviously hinder boarding until the tender is launched. A centerline transom door with a positive latch swings open into the 4-by-7-foot aft deck, with welded 316 stainless steel handrails all around for security. There&apos;s room enough for a couple of folding deck chairs, and, when the optional bimini is in place and the boat is at anchor or at the dock, this is a fine place to relax, well protected from the sun or rain. As you may have surmised, there is no external teak to maintain, here or anywhere else on deck. There are some nice touches here, not the least of which are the hawseholes with integral cleats in the sides and on the transom for proper line leads when tied to a dock. Other features include an outdoor electrical outlet and a flush-mounted shower with hot and cold water for washing down the sole or oneself. A ventilated propane locker with a 20-lb. fiberglass tank is installed in the starboard forward corner, and a big hatch in the sole opens to reveal a large lazarette with room aplenty for mooring lines, fenders, cleaning equipment, and more. Should you choose to install options like the 16,000-Btu air conditioning with reverse-cycle heat (a diesel Espar heater is standard), it will live here, with space left over for cruising gear. A 50-gallon water tank equipped with a sight gauge takes some the available storage space. To enter the saloon, you must first raise the overhead hatch on the centerline at the aft end of the deckhouse and prop it open using the positive-latching struts. The aluminum-frame main cabin door hinges outward to starboard and has a full-length glass panel that, along with the two aftfacing windows and four large side windows (two with screened opening sections), helps make visibility in this cabin outstanding. The layout is simple: two steps down to a central walkway, a perfect-for-napping 7-foot portside settee with comfortable cushions and a high-low movable table that has folding leaves, and a full-cabin-length galley to starboard. Peggy and I found loads of storage space under the settee, which converts to a pullout double, with additional lockers and four drawers beneath the galley counter. Bulkheads are clad in beautifully finished teak veneer, while solid teak is used for the built-in cabinetry and doors. With seven coats of satin-finish polyurethane, there&apos;s no maintenance. North Pacific craftsmen went the extra mile and installed teak surfacing around the inside of the door to match the aft bulkhead. The cabin sole here and throughout the interior is teak and holly, for a traditional look and feel underfoot. The galley has everything you would need to prepare a hearty meal, starting with the aforementioned storage and a 5.7-cubic-foot Nova Kool refrigerator-freezer beneath the standard countertop, a good-looking Corian. The deep, stainless steel sink is recessed into the countertop, which will help keep the working surface dry, and it includes an integral drain-dry surface for cleanup. The two-burner Seaward cooktop is surfacemounted forward of the sink, and the microwave is mounted in a cabinet in the forward bulkhead. Two 110VAC plugs on the backsplash are available for coffeemakers and other electrical appliances, making meal preparation easier. Push-button locks and roller bearings on the drawer sliders make them easy to use and safe in a seaway. Two steps up and forward, the simple yet workable layout continues to shine in the pilothouse, with single seats atop storage lockers flanking the centerline and 6 feet 5 inches of headroom. The helm seat adjusted fore and aft and housed a dedicated bottle locker and a deep storage drawer. The portside seat had a flat pullout panel that created a bench seat across the cabin. There&apos;s a large chart flat to port and a helm console to starboard with a tilted panel for gauges and switches, plus a raised dash (with a standard Ritchie compass) that easily accommodates the optional 12-inch Raymarine chart plotter and autopilot. An overhead panel provides room for other optional electronics like a VHF radio. The teak-rimmed stainless steel destroyer-type wheel is mounted vertically for good standing clearance, and the single binnacle Morse engine control sits far enough forward of the wheel that you won&apos;t bump it accidentally. A control panel for the Vetus 12VDC bow thruster and optional spotlight were close by. In the overhead, there&apos;s an opening hatch for good ventilation. There are three large, forward-facing windows with articulating windshield wipers. Only one of the wiper arms on hull number one had freshwater spray, an effort to conserve the water supply. I mentioned to Trevor that I&apos;d like to see sprayers on all three windows; he promised they would be available on future hulls. I particularly liked the sliding doors on either side of the pilothouse that sealed out breezes nicely when closed, yet opened smoothly for access to the side and forward decks. A spring cleat is positioned within easy reach of the opened door for quick deployment of a breast line when docking singlehanded, and there are stainless steel handrails just above the door for safe ingress and egress. Fuel fills are found on the cabin sides aft of the door; you must close the door to access them. When fueling on the dock side, that&apos;s no sweat, but when fueling on the water side, the aft edge of the door needs a vertical handrail for better balance. Trevor said that, on future hulls, the fills will be moved so that the doors can stay open. Moving forward from the pilothouse doors is made easier with handrails atop the pilothouse and cabin and on both sides of the foredeck&apos;s low toe-kick bulwarks. Standard equipment on the foredeck includes a Lewmar windlass with a chain/rode gypsy and a 600-lb. capacity, a chain-and-rope rode, and a bow pulpit with a self-launching anchor roller for a 25-lb. anchor. The windlass can be operated remotely from the pilothouse or with switches on the foredeck. A courtesy light helps you handle anchoring or dockline duties in low light, and there&apos;s a saltwater washdown to help keep crud off the foredeck and out of your anchor locker. From the pilothouse, three steps down and forward you&apos;ll find the single stateroom, with an enclosed head to port and a hanging locker to starboard. The Blue Sea electrical panel is located to starboard, as well, and opens to reveal color-coded and numbered electrical leads that are cleanly installed. A 30-amp shorepower connector is provided. 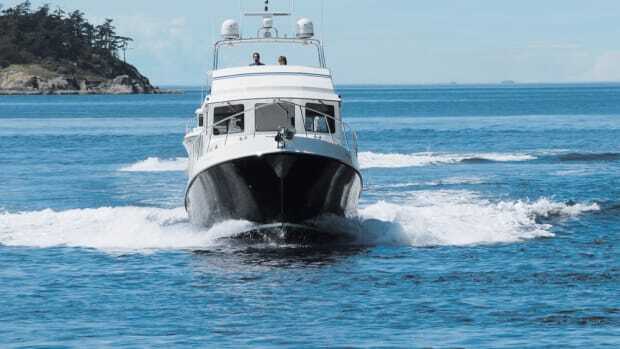 The head compartment features a manual-flush seawater MSD with holding tank and a Tank Watch gauge, but the builder also offers an electric-flush Tecma toilet, an option worth considering. Upper and lower storage cabinets, a solidsurface countertop (Corian on the boat I ran), a stainless steel sink, and a telephone-style shower are notable features. Trevor cautioned me that the compartment was a bit narrow and was due for a modification that would add more shoulder room, but I found it very workable nonetheless. The V-berth has a cabinet and drawers under each bed and a small step forward for those who need a leg up at bedtime. The berth is amply sized for a couple when the filler cushion is in place. In addition to the opening screened portlights, an overhead hatch provides outstanding ventilation and a beautiful view of the night sky. The hanging locker is adequate for most needs, and it includes an overhead shelf for small items you want to keep handy. 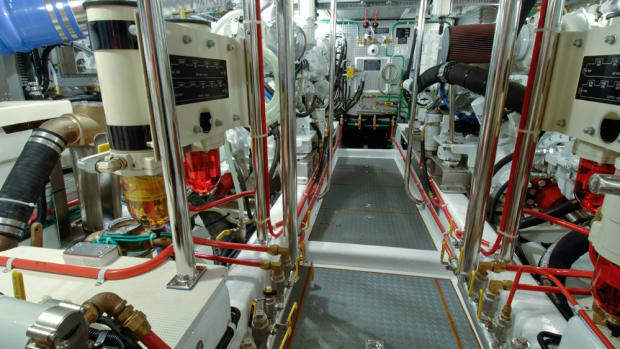 The stairs leading down from the pilothouse fold up and back to reveal the forward portion of the engine room. You can also use the three hatches in the pilothouse sole, but access through the stairs is more than sufficient for checking the sight gauges on the fuel tanks, performing routine engine fluid checks, checking and changing the bronze strainer on the engine&apos;s raw-water intake, changing filter elements on the dual Racor filter, and switching fuel tanks on the simple manifold. An optional 3.5kW NextGen generator will fit nicely on the starboard side. For most of the first day&apos;s passage, from Seattle to Anacortes, Peg and I ran the NP 28 between 7 and 8 knots and burned approximately 3gph. The engine was a single 130hp Cummins QSD, although that has now been replaced by a single 150hp Cummins QSD. Trevor Brice told me that the new engine also should burn approximately 3gph at 8 knots. He also estimated that running the boat at 6 knots will achieve a fuel burn closer to 1gph. I figured a range of roughly 240 nautical miles at 8 knots, and approximately 540 nautical miles at 6 knots, both with a 10 percent fuel reserve. We were lucky to have wind from the westsouthwest for most of the trip, so our trip from Anacortes to Friday Harbor was blessed with visibility that matched our first day&apos;s run. Finding a slip in Friday Harbor&apos;s municipal marina, or even Cap Sante Boat Haven in Anacortes, for that matter, was not expected to be too difficult, mostly because the season was close to running its course. But, just to be sure, I had the nice folks at Marinalife (www.marinalife.com) make reservations for us. I found that we were always expected, even if running late, and that one fewer detail on my plate made our cruise even more enjoyable. Handling the NP 28 under way is simplicity itself, made easier by the autopilot, of course. Hydraulic steering took the work out of steering manually when running the boat at no-wake speeds through places like Swinomish Channel. Docking was effortless due to the large rudder and responsive bow thruster. The hull form is up to the task if you want to push the boat up into the teens and get somewhere more quickly. The only thing I found wanting was trim tabs; Trevor told me North Pacific would be putting them on subsequent hulls. Peggy and I found that the North Pacific 28 was a well-thought-out cruising platform for one or two couples, or a small family, providing all the storage and protection we required for our three-day cruise. The ride was comfortable in protected waters, and in the 1-foot chop we encountered in more open waters. We lived well, slept soundly, and saw much while aboard the NP 28. And we admired her for a long time when we finally gave back the keys in Oak Harbor, on Whidbey Island, where North Pacific Yachts does all of its final commissioning. For those who are looking for a well-found, wellequipped raised-pilothouse cruiser that&apos;s easy to own and keep, the North Pacific 28 will fill the bill nicely. HOLDING TANK 20 U.S. gal.